This performance and its workshop was on Friday 28 July; part of Contact meets Contemporary 2017. 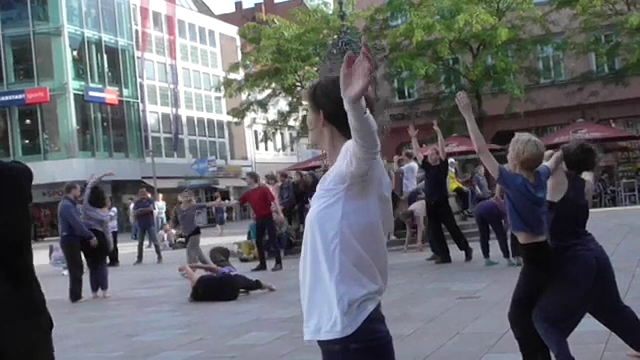 The public performance entitled “Intertwined”, was in Göttingen’s marketplace. This was exciting and a challenge: a two hour workshop leading to a public dance performance. Is it possible? Yes! And it was fun! We workshop the performance which will have three parts: duets; trios; and sextets. We are standing for all these exercises and working with a partner. Play fighting Can you touch the belly of your partner without allowing them to touch yours? Arms & elbows We can manipulate a partners arm and forearm: hanging it; standing it; draping it on a shoulder, etc. ‘Farm animals’ It’s suggested that we rub our faces against each other like farm animals, or if we find this too intimate then using our hands, arms and shoulders. Arm sliding We place our hand on our partner’s shoulder, sliding our hand and forearm on their shoulder. We can hang from it; our partner can lift, etc. Lifts When our partner has slid their arm to our shoulder then we can lift them. We place our arm around their waist/pelvis, and our intention is indicated by dipping – bending our knees – which they follow, and then lift, up! Pausing creates dramatic effect says Markus. Two people can lift another and fly them. A sextet is three duet partners; or two trios! Jumps! When five of us line up in two rows then the other dancer can run, jump and fly. We catch them with out stretched hands! Lifts If five of us encircle the flyer then we can lift them at the pelvis and upper leg. It is like a volcano erupting! We all gather in the market place for a in-situ rehearsal and then the performance. Musician Peter Krug accompanies the dancing on his double bass with others. I duet with Ana Marina Jimenez, and we start by sitting of on the steps of the Gänseliesel fountain which is in the marketplace. We sit, stand, stand, sit in an improvised manner amongst the public – our audience – who are also seated with us on the steps; then we emerge to dance. At the end of the performance when the music stops, we all exit by running to back left of the stage (the marketplace). Afterwards, there is a sense of euphoria – we achieve so much in such a short period of time – barely one afternoon!